On 4th September 2017, Perbanas Institute received a grant from PT Bank Mandiri (Persero) Tbk (Bank Mandiri) to build a mini banking centre at an event held at its Bekasi campus. The mini banking centre is aimed to facilitate students with hands-on experience of the vital aspects regarding the day-to-day operations of a modern bank. The centre is set to include a mock-up banking counter, service stations, as well as internet-serviced computers that will give students insights into the new era of digital banking. Present at the event was Rector of Perbanas Institute Prof. Dr. Ir. 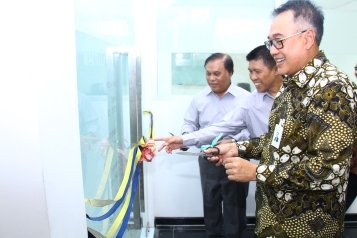 Marsudi Wahyu Kisworo, Senior Vice President of Bank Mandiri Mr Ratmoko; Vice Rector for General and Student Affairs at Perbanas Institute Mr Arus Akbar Silondae; Mr Acong Dewantoro Marsono as head of Perbanas Insititute’s Bekasi campus; and Mr Tri Joko Prihanto as Project Manager of the Perbanas Education Foundation. 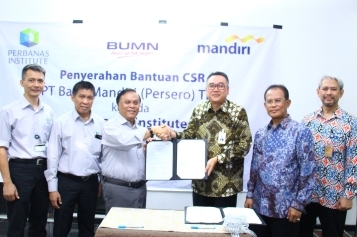 Through its recent partnership with Bank Mandiri, Perbanas Institute has demonstrated its capacity to cultivate new collaborations that are set to impact Indonesia’s finance and banking sector — the institute already has a widespread network of more than 100 local banks for a variety of initiatives. As such, the development of its new mini banking centre will improve the quality of the institute’s graduates by simulating real-world industry experience that will further hone their skill sets and thus fulfil their potential within their chosen professions.